• Aloe Vera: its curative and cosmetic properties have been known since ancient times, in the formula Aloe Vera. Plays an important soothing and softening. • Wheat Protein : Wheat is a cereal rich in proteins within the coloring, play restructures and repairs. • Jojoba Oil : Jojoba oil is a wax produced by the seeds of the jojoba plant that grows in desert areas. Noteworthy are its uses in cosmetics as an emollient that is as emollient polishing. • Bamboo Extract : In China, bamboo is a symbol of eternal youth. Rich in nourishing active ingredients and normalizing, gives the hair elasticity and shine. • Panthenol: said beauty vitamin within NATURAL COLOR plays a nourishing and moisturizing. • Alpha Bisabolol (Chamomile extract) is an oil obtained from the leaves of Matricaria chamomile, widely used for its relaxing and toning the skin, is an excellent anti-inflammatory and soothing. • Simplicity: all colors present in the folder perfectly cover white hair in a direct way, without having to mix with the natural series. 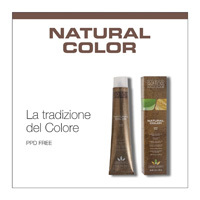 This facilitates the intermiscelazione of nuances and simplifies the work of hairdressers. • Coloring delicate : it contains a low percentage of ammonia, it opens the cuticle slightly. The micro - pigments penetrate into the hair cuticle, even if it is not fully dilated, and only when they are inside the molecules oxidize becoming bigger and colorful, this is possible thanks to special retarding oxidation. The dye molecules are so trapped in the structure of the hair giving results very durable. In addition, an intact cuticle will reflect the color rendering bright and intense. Shades available in 64 shades divided into 12 families : NATURAL ASH, PURPLE, BEIGE, BROWN, GOLD, COPPER, RED MAHOGANY AND SUPERLIGHTENERS. A distinctive feature are the two series: TONER (for toning streaks and discolorations) and MIX & STREAKS (to bleach and color in one step).